Last week, school meal program employees gathered at the Tacoma Convention Center to attend the annual Washington School Nutrition Association Conference. This event allows attendees to participate in nutritional classes and learn about new products that can be incorporated into school meal menus! …and that’s a wrap! WSPC has officially completed our summer FryDay program. Over the last two months, we have had the opportunity to travel across the state and share FREE Washington fries with excited community members! We visited many different cities on our tour including Moses Lake, Redmond, Ritzville, Othello, Mount Vernon, Sedro-Woolley, Leavenworth, and Quincy. As many of you already know Friday, July 13th was National French Fry Day!! How did you spend your Friday? WSPC staff members spent our day passing out FREE Washington Fries in Sedro-Woolley, WA! The shoestring fries donated by Lamb Weston were a crowd favorite. 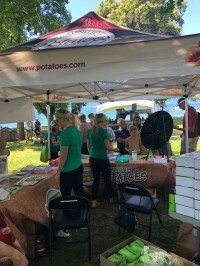 After several months of preparation, WSPC kicked off our Powered by Potatoes campaign at the 11th annual ChelanMan Triathlon in Chelan, WA! The purpose of this race is to come together as a community to support healthy lifestyles for our youth, families, and athletes. As a sponsor WSPC had the opportunity to share information, recipes, and athletic gear with more than 1,400 athletes in Chelan last weekend. In Washington, the agriculture industry is responsible for creating nearly 36,000 jobs and contributes $7.4 billion dollars to the economy. Clearly there are many different job opportunities in the agriculture industry, but today we are going to focus on the job of an agronomist. 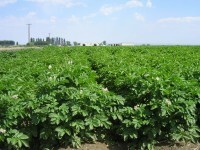 Agronomists are also known as crop production specialists or crop scientists. On Father’s Day weekend, WSPC continued our mission to share FREE Washington potatoes throughout our great state. Early Friday morning, we loaded up and headed over to western Washington for the weekend where we attended the 13th Annual Brewers Fest in Redmond. As part of our ongoing mission to share Washington potatoes throughout the state, we decided to start the summer off in our own town. Today, we parked our new fry trailer right outside Moses Lake High School’s front doors where we handed out free fries, Spud Nation t-shirts, and hats. Do you feel as if there is always at least one complainer or picky eater at your dinner table? Or maybe no matter how hard you try, your 10-year-old just won’t eat her kale salad. If you are struggling with any of these issues, don’t worry, you are not alone. Potato growing season is among us! Farming is a year-round, around the clock job but today we are going to break down the growing season timeline for you. The planting of potatoes begins as early as March and can go through the spring until May. Planting time varies throughout our state because of potato variety and farm location. Are potatoes healthy? YES! Potatoes have proven to be one of America’s most versatile vegetables with remarkable nutritional value. If you take a closer look you’ll find that potatoes are packed with fiber, potassium, protein, vitamin C, antioxidants and more! There are so many ways to bake a potato. Today, we are going to give readers a few inside tips for making delicious baked potatoes! Many people believe that wrapping potatoes in foil is beneficial. 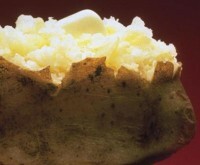 However, wrapping potatoes in foil before baking increases the cooking time and makes the skin and flesh of the potato soggy due to the trapped steam. Agriculture has always been a big part of my life. Growing up with a Dad and Grandfather who were both farmers gave me a glimpse of a unique, hardworking, passionate community. As the years went on, I began to take more interest in the agriculture industry. My interest grew slowly, and before I knew it I found myself working in the agriculture field as well! Agriculture is a major industry in the Evergreen State, and the potato industry alone creates 36,000 jobs throughout Washington while contributing $7.4 billion dollars to the state’s economy. 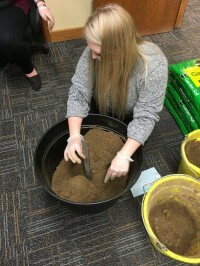 Washington Potato Growers on average raise 170,000 acres of potatoes annually, on soil supporting the nation’s highest per-acre potato yields, which are 44% higher than the U.S. average.